300 pages | 15 B/W Illus. Global movements and protests from the Arab Spring to the Occupy Movement have been attributed to growing access to social media, while without it, local causes like #bringbackourgirls and the ice bucket challenge may have otherwise remained unheard and unseen. Regardless of their nature – advocacy, activism, protest or dissent – and beyond the technological ability of digital and social media to connect support, these major events have all been the results of excellent communication and public relations. But PR remains seen only as the defender of corporate and capitalist interests, and therefore resistant to outside voices such as activists, NGOs, union members, protesters and whistle-blowers. Drawing on contributions from around the world to examine the concepts and practice of "activist," "protest" and "dissent" public relations, this book challenges this view. 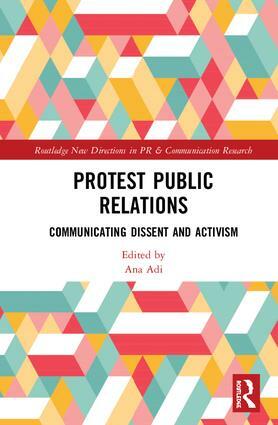 Using a range of international examples, it explores the changing nature of protest and its relationship with PR and provides a radical analysis of the communication strategies and tactics of social movements and activist groups and their campaigns. This thought-provoking collection will be of interest to researchers and advanced students of public relations, strategic communication, political science, politics, journalism, marketing, and advertising, and also to PR professionals in think tanks and NGOs. Ana Adi is a Professor of Public Relations/Corporate Communications at Quadriga University of Applied Sciences in Berlin. When not analysing public relations from a critical perspective, Dr Adi’s research, teaching and consultancy focuses on the strategic uses of digital and social media in a variety of communication fields. You can find more about her work on www.anaadi.net. Current academic thinking about PR and related communication is a lively, expanding marketplace of ideas and many scholars believe that it’s time for its radical approach to be deepened. Routledge New Directions in PR & Communication Research is the forum of choice for this new thinking. Its key strength is its remit, publishing critical and challenging responses to continuities and fractures in contemporary PR thinking and practice, tracking its spread into new geographies and political economies. It questions its contested role in market-orientated, capitalist, liberal democracies around the world, and examines its invasion of all media spaces, old, new, and as yet unenvisaged. The New Directions series has already published and commissioned diverse original work on: PR’s influence on Israeli and Palestinian nation building; its origins in the history of ideas; a Jungian approach to its ethics and professionalism; global perspectives on its professional practice; PR as an everyday language for everyone; as emotional labour; as communication in conflicted societies, and its relationships to cooperation, justice and paradox. We actively invite new contributions and offer academics a welcoming place for the publication of their analyses of a universal, persuasive mind-set that lives comfortably in old and new media around the world.